Much has been made about the spread of technology into North Korean society. No doubt, North Korean elites in Pyongyang are highly aware and desirous of Apple products. Westerners who travel to North Korea can attest to this, and North Korea is even said to be developing a number of unique apps (Kim Il Sung University, Kim Chaek Technical University, as well as Pyongyang University of Science and Technology all have strong programs in what might loosely be called computer science.) 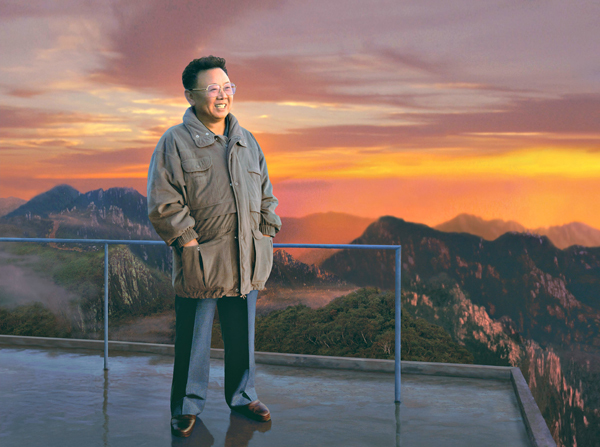 Rodong Sinmun, the state newspaper, has set up a smooth-looking website in three languages and has demonstrated some rather stunning, if sometimes uneven, skills in the use of something resembling Adobe Photoshop. In what amounts to a large North Korean-Egyptian thumb in the eye of regional telecom giants China Mobile and China Unicom, the Cairo concrete and cell-phone specialist firm Orascom has a fantastic and growing monopoly in Pyongyang, which frays only along the long northern fringe of North Pyong’an province. Had it been allowed, surely the crowd at the Moranbong Theater on July 6 would have brandished their cell phone cameras to record the event. At the same time, there are clear limits to how far-reaching technological changes have gone, or what they ultimately mean. North Korean television reporters who take coveted official trips to China still travel with huge, heavy, and old reel-to-reel cameras; these whir and clack as they record the glorious impact of North Korean culture. (I was interviewed by one of these crews in Chengdu and, in addition to being completely blinded by their sporadic light –in lux Kimitas – I feared the cameraman might get his finger chewed off by the ghost in the grinding machine. Likewise, Chinese film crews who arrived in Pyongyang for North Korea’s first ever joint cinema production project were shocked to find their colleagues completely ignorant of digital production. “Don’t you want to take the lens off of the digital camera?” I asked the KCNA reporter in Chengdu. “Just keep talking,” she said, as the reel-to-reel whirred and she held up the shuttered digital thing anyway, which I never saw her use all night. North Koreans can pose anonymously with I-pads covering their elite faces in Pyongyang all they want; the Chinese press can plaster these images all over the cover of Southern Weekend in the hopes of stemming the mockery of the DPRK as a wholly backward place immune from China’s pedagogy of modernization. Still, the digitalization of North Korea remains a veneer phenomenon. Alex Ross, the State Department’s “Undersecretary for Innovation” (short for his actual title, which is “Ultimate Slickster who makes the Young Bill Clinton look like the Old Mike Huckabee/Part-Time Tommy Hifilger Model/Hypnotizer of Congressional Committees”) can put away his PowerPoint and stow the tweets of his myrmidons: The kind of Internet-induced revolution described by Alex Ross is not coming to North Korea anytime soon. Just as a White House speech does not a coherent policy spawn or a reality create, a single sentence from the lips of Kim Jong Un about the need for more knowledge of the outside may mean precisely nothing. Of course, some things are left best undone: alone in the theater, Kim Jong Un had a large ashtray placed in front of him at the concert. But, perhaps feeling self-conscious for once, he seemed to fail to light up. Which again calls into question the characterization of the Moranbong Band as a legitimate rock group: No cell phone pics, no lighters in the air, no illicit smoking, and – we can only assume – no vomiting in the theater’s cavernous toilets. It would have been a much bigger deal if they had played Vivaldi.